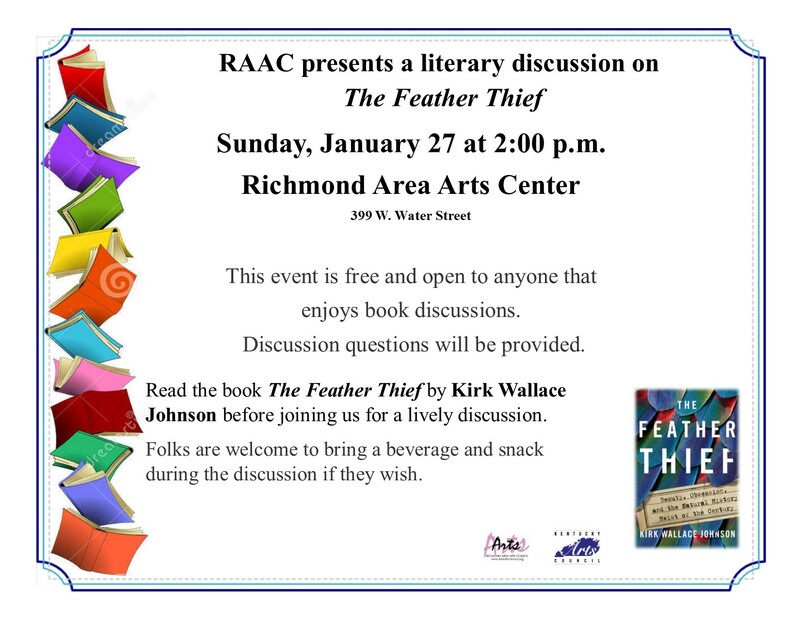 Read the book The Feather Thief by Kirk Wallace Johnson before joining us on Sunday, January 27 at 2:00 pm at the art center for a lively discussion. Two years later, Kirk Wallace Johnson was waist high in a river in northern New Mexico when his fly-fishing guide told him about the heist. He was soon consumed by the strange case of the feather thief. What would possess a person to steal dead birds? Had Edwin paid the price for his crime? What became of the missing skins? In his search for answers, Johnson was catapulted into a years-long, worldwide investigation. The gripping story of a bizarre and shocking crime, and one man’s relentless pursuit of justice, The Feather Thief is also a fascinating exploration of obsession, and man’s destructive instinct to harvest the beauty of nature. Folks are welcome to bring a beverage and snack during the discussion if they wish. The discussion will take place downstairs in the Stained-Glass room. Discussion questions will be provided. This event is free and open to anyone that enjoys book discussions.